Happy Wednesday! I don't know about you, but 2019 has been a stressful year so far. Not in any earth-shattering way, thank goodness, but to the point where I frequently feel on the verge of being overwhelmed. Some of it is good stress--what they call eustress, which is physically or psychologically beneficial--and some of it is definitely distress. (And that's without throwing politics into the mix.) There just don't seem to be enough hours in the day to get everything done, which is nothing new or unusual for any of us, I'm sure. For years, I've toyed with the idea of starting a meditation practice. I was never sure how to go about it the right way, though, and I wasn't convinced I was that kind of person (whatever "that" means). Books were helpful but a little too static, and joining a class seemed too intimidating. What if my chakras started acting up in public or something? But now, well, this is one place where I have to give technology credit, because there are multiple meditation and mindfulness apps that made dipping my toe into the calm waters of meditation a whole lot easier. I tried a variety of meditations during the week. The shortest was a minute long, the longest was twenty. Most of them were guided, but a couple of times, I just listened to some relaxing music. I meditated in the morning, at night, and occasionally in between. Even though the guided meditations were fundamentally similar in nature, they varied a lot depending on the presenter. Different accents, different pacing, different background music... Some of them didn't quite click for me, but with 15k to choose from, it was easy to find a better fit. Frankly, I was surprised at how much I enjoyed my meditation time. On the whole, I felt happier and less stressed this week--though that might be because we also had some very lovely spring weather. Maybe when the blizzard we're expecting hits and drops the temperature by 40 degrees F, I will be back to my normal grumpy self. Although the Take Its are definitely piling up, I have to add this one to that list, as well. A very happy April to you! The first quarter of 2019 is in the books, so I thought I'd start with a Take It or Leave It update. So far, I've tried making twelve small changes in my life and decided to keep most of them, which is great...but the flip side is that I started losing track of what I'm supposed to be doing and when. So I set up a spreadsheet to organize what I need to do every day, every other day, or a few times a week. I think that's going to help, and hopefully I won't have a hot mess on my hands by mid-year. 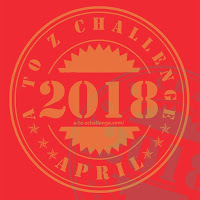 April is also the month for Blogging A to Z. I'm not doing that this time around but will be visiting as many blogs as I can. I really like seeing the fun, smart, wise, and poignant themes people come up with. And I met a wonderful group of bloggers last year, whose blogs I still very much enjoy. I love a bargain and always feel good when I can save a bit of money, so one might assume I'm a whiz with coupons. I'm not. For years, my MO was to cut them out and then find them crumpled in the bottom of my purse three weeks later. 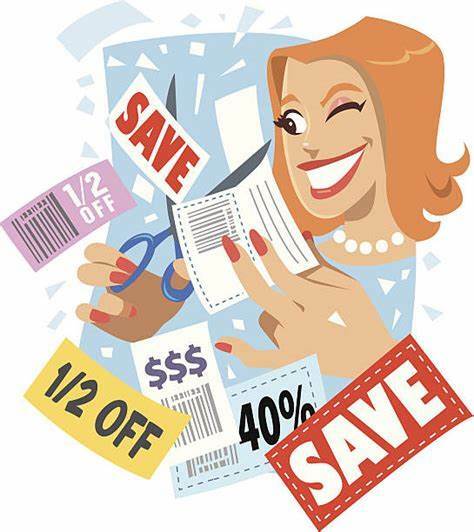 These days, I'm inundated with coupons and "special offers" from all sides, so I thought I'd devote a week to trying to maximize my savings potential. Digital coupons are much easier to use than paper ones and do not result in purse trash, so those were my go-tos at the grocery store. Before I went to shop, I scrolled through the store's app and clicked on the coupons I thought I might use. This took some time and patience and honestly didn't result in much savings over and above the store's sale prices. Ditto for Target. Maybe I didn't buy enough, or didn't buy the right things, but it really didn't seem worth my while. Kohl's is a different story. Even my sons, who are not shoppers, know not to ever pay full price for anything at Kohl's. My 20% off mail coupon was digitally upgraded to 30% off, plus an additional $10 savings. That's all very well and good, but the thing about coupons is that I often end up buying things I don't need, from a box of crackers to a polka-dotted jacket. Stores know this, of course, which kind of makes me resent the whole process. Plus, having to download all the various apps, each which requires setting up a separate account so I can receive dozens of emails I don't want, drives me nuts. I didn't do as much shopping this week as I thought I might, but, hey, not buying something is like saving 100%, so I no doubt came out ahead. Going forward, I will still look for a good deal for big ticket items, clothing, and admission fees to theme parks and the like. For routine purchases, however, I just don't have the commitment to make the coupon lifestyle pay off, so this one is a Leave It. China's earliest form of written communication is oracle shell writing, which dates back approximately 3,500 years. The Chinese consider calligraphy to be a regimen to calm the mind and nurture the heart. Traditional calligraphers make their own ink by grinding an ink stick in water on an ink stone or slab. This has the additional benefit of warming up the hand and wrist. The preferred paper is Xuan paper, made of 40-80% elm bark. Each character belongs to a "radical," which is like a root. The radical for waterfall, for example, is water. The 8 basic strokes are always done in order. I'm sorry to report that I did not grind my own ink. Instead, I used a brush marker I picked up from the craft store. The book includes plenty of practice space, so I didn't feel the need to track down the special elm bark paper, either. Each day, I practiced for at least fifteen minutes. As advised in the book, I started with the easiest character: one--a single, straight horizontal line. In addition to representing the number one, it also means "only," "single-minded," "special," and "unique." Over the course of the week, I grew fairly comfortable tracing even the more elaborate characters but was less successful winging it on blank paper. I usually got close enough, though, that someone who knows could probably recognize what I was getting at--the same way I can read a teenage boy's messy penmanship. Because I was pretty focused on trying to do it right, I didn't achieve much peace or calm. But with practice, it seems entirely likely. There is something very meditative about completing the correct strokes in the correct order, with the result being both beautiful and meaningful. There are plenty of characters in the book for me to continue to learn and practice, so this one is a Take It. Take everything out of closets and drawers. Consider each item individually to determine whether it sparks joy. I am intrigued by the sparking joy part, but I also know that I don't have the stamina right now to KonMari my life. If I were to make a pile of all my clothes, in a few days, I would have...the same pile of clothes, but with a couple of helpings of guilt and irritation on the side. But that doesn't mean I can't take small steps toward "life changing magic," so my Take It or Leave It for last week was to clean one shelf or drawer every day. This was in addition to the routine household tasks that somehow need to be done approximately every six minutes. I look at this week as practice for a time in the future when I'm willing to commit to a big KonMari purge. But maybe if I wait long enough--decades, hopefully--I can jump right into Margareta Magnusson's book The Gentle Art of Swedish Death Cleaning, which, in a nutshell, involves getting rid of all my crap before my boys have to deal with it. This mini-KonMari Take It or Leave It is a Take It, but probably only two or three times a week instead of daily. It is only when you put your house in order that your furniture and decorations come to life. Ayurveda has a saying: "When you eat standing up, death looks over your shoulder." That strikes me as especially dire because it's a bad habit of mine. I'll eat half my lunch while I'm standing at the counter making it and half my dinner while I'm cleaning up the kitchen. I'll grab a few nuts and eat them on the way to the laundry room or a few crackers as I head out the door. I'm a roving nibbler of the worst order. In a traditional hunter/gatherer society, I'd be the one who returned home with an empty basket every time because I ate all the berries as I was walking along. Last week, I tried to break the habit...or at least put a dent in it. My rule was that I could only eat while I was sitting at my dining table. Frankly, this was not my most successful endeavor--partly because of a family circumstance that threw me off my schedule and stressed me out, and partly because this eating-on-the-go habit is more deeply ingrained in me than I imagined. I'm not a drive-through person, so eating in the car isn't an issue, but apparently anywhere in my house is fair game. (Except the bathroom, because ewww.) The ridiculous thing is that it somehow feels more efficient to eat when I'm doing other things. Multitasking, you know. So, even with a concerted effort to pull up a chair every time I put food in my mouth, I probably only remembered to do it about 60 percent of the time. When I did remember, I usually felt pretty good about it. Sitting down allowed me to be much more mindful, and I'm sure I consumed fewer unnecessary calories, too. But it was occasionally a little irritating, as if I had not death looking over my shoulder but a nosy little hall monitor telling me to slow down, there's no fire. I would love to say that this is a slam-dunk Take It, that I saw the error of my ways and will now sit, relax, and enjoy each morsel of food, but this one is going to take some time. At least now, though, I'm more aware of it, and sometimes that's half the battle.